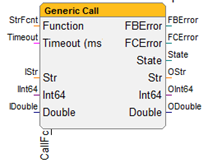 If a HIGH signal is present at the input "CallFc" and no other block of this type is active, the function block calls the function, which is defined at the input "StrFcnt". With each following block calling, it is being checked, if the function call has been processed or has reached its timeout. If errors occur during processing, they are shown at the corresponding outputs. The maximum number of detectable return values must be set using the function block. System – defined functions can be accessed with this function module. If several blocks are used, only one block receives the execution token. Only when this block is finished or its timeout has expired, the next block of this type receives the token. All other blocks are processed in the normal time-defined context. The block holds the "READY" state until it is reactivated. This status is also set if an error occurred during processing.